BEIJING/SHANGHAI: A major explosion at a chemical plant in southwestern China has killed 19 people and injured 12, authorities said yesterday, the latest deadly industrial incident in the world’s largest producer of chemicals. It comes amid a drive to strengthen industrial safety, with China ramping up checks over the last year, in the wake of some high-profile incidents at coal mines and chemical plants. The cause of Thursday evening’s blast at Yibin Hengda Technology in an industrial park several hours southeast of Chengdu, the capital of the southwestern province of Sichuan, is not yet known, the local government in Jiang’an county said. The injured are in stable condition and an investigation has begun, state news agency Xinhua said. The company, which makes chemicals for the food and pharmaceutical industries, did not immediately answer telephone calls from Reuters to seek information. Photographs on Chinese social media showed a huge fire and plumes of smoke rising from the facility. The fire, which broke out early on Thursday evening, was put out by 11.30pm (1530 GMT), the government said in its statement. “I heard a big explosion, it was really loud and I felt the ground shaking,” Liu Ping, a manager from the industrial park told China Newsweek, who was in his office at the time of the eruption. 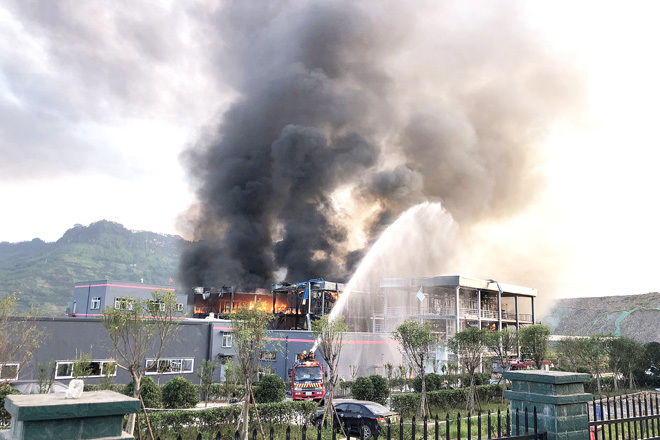 A trio of three-storey buildings were reduced to their steel frames by the explosion, the Sichuan Daily newspaper said, citing eyewitness accounts. Footage on its website yesterday afternoon showed the skeleton of the burnt-out buildings. Windows of nearby buildings were shattered by the explosion at the factory, which is surrounded by a sand and gravel plant, it added. The plant has three production lines, making 300 tonnes per year (tpy) of benzoic acid, which is used in food preservatives, and 2,000 tpy of 5-nitroisophthalic acid, for medicines and dyes, the regional environmental protection bureau says. China’s breakneck pace of economic growth during the last decade has resulted in a spate of industrial accidents. In 2015, an explosion in a chemical warehouse in the northern port city of Tianjin killed 165 people.